I recently had surgery to repair my ankle. So far, I’ve been on crutches for five weeks, with another three or four weeks to go before I can ditch the crutches. Our 12-year-old golden retriever thinks this is a perfect situation. He loves being able to spend 95% of his day sleeping a few feet from me. 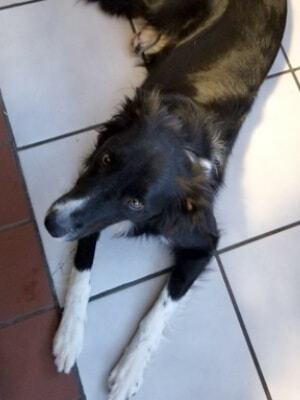 But the three Border Collies are used to long walks, training, and working sheep nearly every day. The forced down time is not their idea of fun. One thing I can do to occupy them is make their food last more than the 35 seconds it usually takes them to scarf it down. So today I pulled out some bones to stuff. These are 4” sterilized marrow bones. I filled them with the dog’s food and they are in the freezer now. Tomorrow, they will be one of my weapons in the war against Border Collie boredom. I measured out 4 cups of kibble. That’s one meal for the four dogs. 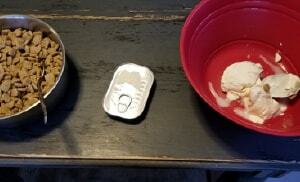 After it soaked for an hour, I added some plain yogurt and a can of sardines. 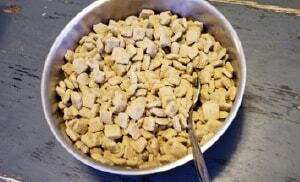 You can just use the softened kibble or add in your choice of extras. Some of the things I add are meat, carrots, pumpkin, apples, or canned food. 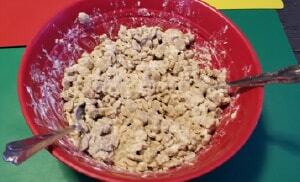 I like the resulting mixture to be a little wetter than cookie dough. My dogs are pretty determined to get the food out, so a little moisture makes it freeze harder. 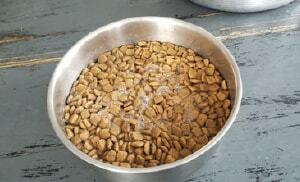 If your dog is new to this way of eating, you could make the mixture drier so it’s easier for your dog to get the food out. Brook was hoping I would drop some for her to clean up…. I mixed all the ingredients and spooned it into the bones. I can stuff the whole bucket of bones in about 45 minutes. This batch only filled about a third of my bones. Here is a stuffed bone, ready for the dogs. 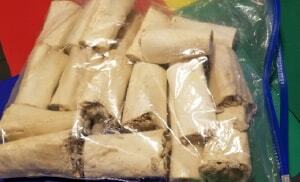 And here is my bag of 19 stuffed bones, ready for the freezer. If they were only getting fed from bones, each of my dogs would need roughly 8 bones a day. 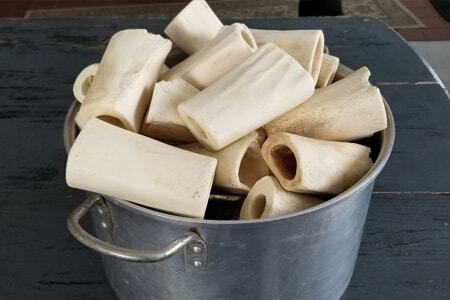 Each bone will take them about 10-15 minutes to empty. So, their food for the day would take an hour and a half to two hours to eat. Instead of the less than two minutes the same amount of food would take from a bowl. Plus, all the working and gnawing will help to tire them out. Once each bone is empty, I will pick it up, wash it with warm soapy water, let it air dry and refill. These bones are all between 2-5 years old. Some have small chips, but I’ve never had a problem with pieces breaking off. I’ve had one or two that split and needed to be thrown away. 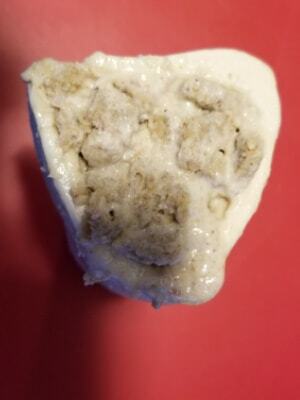 Have you tried feeding your dogs from stuff bones? If so, comment below and let us know about your experience!